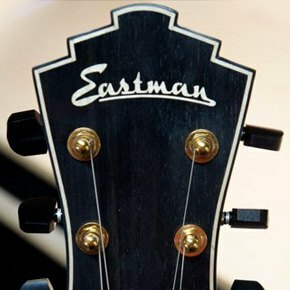 Since its inception in 1992., Eastman Handcrafted Guitars & Mandolins has taken pride in useing only the very highest quality tonewoods and traditional, hand-crafting techniques. All but the most laborious tasks are done without the use of power tools. The company started practically in the back of a car, and has since grown to a global player in the music business. Despite the demand, the company takes care that each and every product receives the same amount of attention and meets all the quality standards. The luthiers at Eastman are dedicated and motivated professionals whose aim is near perfection, as per the ancient Chinese philosophy. Over the years, the company has made a reputation for quality instruments, bows and instrument cases, but at affordable prices, giving customers worldwide a great advantage over the earlier generations. After the founder, Qian Ni, saw the need for affordable archtop guitars, the company studied numerous vintage models, and resident luthiers started building authentic models. Success was rapidly achieved, so it was only logical that the company branches out into other mandolin-type instruments – flattop acoustic guitars, electric guitars and various hybrids and accessories. Ever since, Eastman Guitars has become widely recognized and rightly lauded guitar manufacturer. We have taken the liberty of sifting through today's market in a bold attempt to find the best Eastman guitar out there. The results of our quest patiently await below. For more information on models and color options, check out the Acoustic section of Eastman's website. When you want to take your playing one step further, the Eastman E20D Dreadnought is the right way to go. Read on and find out how. The E20D is the flagship product of Eastman Guitars, hand-picked to give you the best dynamic response, whether you intend to do some soft strumming or hard picking. This dreadnought is a combination of a solid Adirondack spruce top and hard-carved scalloped X-bracing, along with solid rosewood back and sides. The mahogany neck and ebony fingerboard nicely complement the build, and herringbone body binding does a fine job of protecting the edges and making it look cooler. This all combines to give the E20D a rich and full tone, and enough volume to fill the room, and then some. Nice natural finish tops off the combo. The axe’s fretboard features 20 silver & nickel frets and snowflake inlays, with the Martin SP Phosphor bronze strings sitting comfortably on a combination of ebony bridge and bone saddle. The Chrome Vintage Open-Gear Gotoh tuners will make your life easier. Along with the Eastman E20D Dreadnought Traditional Flattop Acoustic Guitar you get a standard hardshell case for protection, as well as the impressive Eastman Limited Lifetime Warranty. Crafted out of premium tonewoods using virtually no power tools, the E10D is not exactly the golden standard of dreadnought guitars, but it’s pretty close. Let’s get to know this beauty up close! The E10D delivers great resonance and room-filling volume thanks to a combination of woods used for the body. The top is solid Adirondack spruce, with solid mahogany back and sides and hand-carved scalloped spruce X-bracing to support and match the top. The neck is solid mahogany, while the bridge and fretboard are ebony. These, along with the hand-fitted dovetail neck joint combine with the body to yield a full-bodied tone with some growl for good measure. It’s also got some decent sustain. The fingerboard is 25.5-inch scale and numbers 20 nickel silver frets. It is set with a M. O. P. Microdot Inlay. The strings are Martin SP Phosphor Bronze .012-.054, and they rest on a combination of ebony bridge and bone saddle. The sonic blast of the E10D is considerable (the thing is loud), and the Chrome Vintage Open-Gear Gotoh tuners will hold the tune for a long time. The offer includes a hardshell case to keep that natural finish from scratching, but also, perhaps more importantly, a limited lifetime warranty. Combining utility and style, the folks over at Eastman’s have come up with the AR371CE Archtop, a beauty of a guitar, with personality to match. Let’s get to know her a bit closer. The harmonious combination of tonewoods brings a mellow, yet bright tone, with thick lows, furry mids and sparkly highs. The body is a Florentine-type cutaway, and solid maple through-and-through – top, back and sides. The neck is also maple, while the 24.75-inch scale fingerboard is rosewood, with 20 Dunlop 6130 frets and Split Block Inlay. The Sunburst finish really completes the picture. The team at Eastman thought that the AR371CE would go along well with a single-mount humbucker for pickup that controls volume and tone, a floating rosewood compensated bridge and a bound plastic pickguard. See if you agree. The strings that this axe comes with are D'Addario EXP Coated Phosphor Bronze .012-.053. For tuning, there are Vintage Tuners (these will hold the tune nicely). There’s a hardshell case thrown into the deal, as well as the Eastman Limited Lifetime Warranty. If you’re still indecisive, bear in mind that the AR371CE Archtop is ideal for aspiring (as well as accomplished) jazz players. Plus, we're looking at a top bang for buck! If there ever was an affordable and well-made Orchestra Guitar, the Eastman E10OM is it. It’s designed to deliver a well-balanced sound with considerable dynamic range, and be heard among other instruments. The body is a combo of solid Adirondack spruce top and mahogany back and sides, supported by the hand-carved scalloped X-bracing. This manner of crafting is a true hallmark of Eastman Guitars. The body couples with a mahogany neck to give that iconic and instantly recognizable dreadnought shape. The E10OM features an adjustable two-way truss rod to stabilize the neck. Moreover, it sports quality ebony fretboard and bridge, and a hand-crafted dovetail neck joint. It sits very comfortably in your lap for prolonged practice or small-venue performances. The guitar incorporates a 1.75-inch wide bone nut to support the strings, as well as an ebony/bone bridge/saddle (respectively) combo. There are 20 nickel silver frets, well-dressed, on a 25-inch scale fretboard that also features a M.O.P. Microdot inlay. The strings are Martin SP Phosphor Bronze .012-.054, and will hold the tune nicely with the help of the Chrome Vintage Open-Gear Gotoh tuners. Take this baby now and enjoy peace of mind with complimentary hardshell guitar case and Limited Lifetime Warranty. The widely-acclaimed Eastman E20OM Orchestra Traditional Flattop Acoustic Guitar Sunburst Finish is here! And, boy, does it have something to say. Its voice comes out rich and powerful, with admirable dynamic range and a natural-finished face to match. If Ophelia took a page out of Eastman’s book, Hamlet might’ve been kinder to her. The solid quality Adirondack spruce top is combines with hand-carve scalloped X-bracing and rosewood sides and back to deliver rich and mellifluous harmony of tones. The herringbone binding serves well to absorb shocks and protect the body from inadvertent damage. The neck and fingerboard are mahogany and ebony, respectively, and they help a bunch to smooth the brightness of the spruce/rosewood combo. The ebony fretboard is 25-inch scale, and takes 20 nickel silver frets, as well as snowflake inlay. The D'Addario EXP Coated Phosphor Bronze .012-.053 are supported by 1.75-inch-wide bone nut and a 2 5/32-inch-spaced ebony/bone bridge/saddle combo. With the help of the Chrome Vintage Open-Gear Gotoh, the original strings will keep the tune, but you may opt differently if you have a favorite. Eastman E20OM Orchestra Traditional Flattop Acoustic Guitar Sunburst Finish comes with a hardshell case to keep it, as well as a Limited Lifetime Warranty by Eastman. The Eastman E20 Parlor Traditional Flattop Acoustic Guitar will make a good central piece of any guitar collection. As expected from a quality manufacturer like Eastman, the E20 Parlor is both elegant and smooth as honey when it speaks, with a nice punch rich tones. The tonewood combination takes solid Adirondack spruce for the top, with Indian rosewood for back and sides. The bracing is Eastman’s hand-carved scalloped X-type, made to match the top. The stylish look is completed with herringbone binding and sunburst finish. The mahogany neck supports a 24.9-inch scale ebony fingerboard, which in turn holds 19 nickel silver frets and snowflake inlay. The bridge and saddle are ebony and bone, respectively, with 2 11/32-inch spacing, whereas the bone nut comes in 1 13/16-inch wide. The strings coming with this baby are D'Addario EXP Coated Phosphor Bronze .012-.053, and you can help them hold the tune using the Chrome Vintage Open-Gear Gotoh tuners. The guitar comes fully set-up “out of the box”, which just goes to show the level of customer care you get with this puppy. As is customary with Eastman guitars, the Eastman E20 comes with a hardshell case and Limited Lifetime Warranty. The Eastman E20 Parlor Traditional Flattop Acoustic Guitar with Sunburst Finish will make a good central piece of any guitar collection. As expected from a quality manufacturer like Eastman, the E20 Parlor is both elegant and smooth as honey when it speaks, with a nice punch rich tones. If you’re looking a guitar to convey that raw, rugged emotion of blues, there’s no better way to go than the E10P Parlor Acoustic. Why? It’s because this puppy has Mississippi Delta written all over it. It delivers heady tones with enough edge to cut through metal. The solid Adirondack spruce top and mahogany back and sides give the E10P that woody quality that lends itself perfectly to fingerpicking. The top gets its support from hand-carved scalloped X-bracing, and its looks from natural finish. The neck is mahogany, with ebony fretboard. Ebony also goes into making the pyramid bridge of the E10P, while the saddle is bone, with 2 11/32-inch spacing. The nut is bone as well, and has the width of 1 13/16". About the fretboard – it’s a 24.9-inch scale board, with 19 silver nickel frets and M. O. P. Microdot inlay. The whole combo (apart from the inlay) gives this guitar enviable sustain. The E10P also features a two-way adjustable truss-rod, hand-fitted dovetail neck-joint, slotted peghead withhand-carved diamond volute and Chrome Vintage Open-Gear Gotoh tuners. With the E10P you get the Martin SP Phosphor Bronze .012-.054 strings, as well as a hardshell case and a Limited Lifetime Warranty. 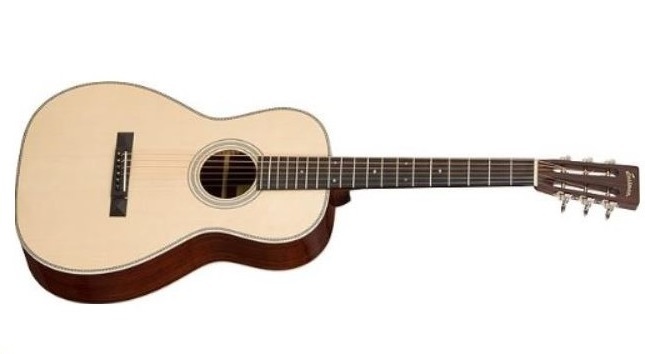 The Eastman AC422CE Grand Auditorium Cutaway Acoustic-Electric Guitar gives you exactly what it says on the tin – a versatile instrument suitable for multiple uses, such as fingerpicking, flattpicking, as well as vocal backing. Its voice will give you a balance tone from highs, through mids, down to lows, and powerful enough a volume to be heard among other instruments. The Venetian-style cutaway body is made of solid Sitka spruce top and rosewood back and sides, and it is supported by hand-carved scalloped X-bracing. There’s an adjustable two-way truss rod to stabilize the mahogany neck, a hand-fitted dovetail neck joint and a 25.5" scale ebony fretboard. This small-bodied beauty has a natural glossy nitrocellulose finish. In addition, the fretboard packs 20 nickel silver frets, and features a Pearl Dot inlay. The frets are well-dressed and feel smooth. The pickup system is a Schertler Lydia bridge/saddle combo in rosewood and bone, respectively, with 2 5/32-inch spacing. The bone nut is 1 3/4 inches wide. This whole setup is topped with Chrome-plated Gotoh tuners and D'Addario EXP Coated Phosphor Bronze .012-.053 strings. To make things perfect, the Eastman AC422CE Grand Auditorium Cutaway Acoustic-Electric Guitar comes with a hardshell case and Eastman Limited Lifetime Warranty. Much like the Eastman AC422CE, the Eastman AC322CE Grand Auditorium Acoustic-Electric Guitar is a versatile little devil that will come in handy for fingerpicking, flattpicking, as well as vocal backing. It has somewhat different voice quality, due to the different choice of tonewoods and pickups, but the overall quality, balanced range and powerful volume remain. The body is a Venetian-style cutaway with solid Alaskan Sitka spruce top and Sapele (African mahogany) side and backs, with inlaid wood Rosette. Bracing is standard Eastman hand-carved scalloped X-type, while the truss-rod for the mahogany wood is a two-way. There’s a hand-fitted neck joint. The fretboard has a scale of 25.5-inch (not unlike AC422CE), and holds 20 nickel silver frets, as well as a Pearl Dot inlay. Unlike AC422CE, the AC322CE has Fishman Matrix VT - Bridge/Saddle 2 5/32-inch Spacing combo making the pickup system, with rosewood and bone used for material respectively. The 1 3/4-inch-wide nut, like the saddle, is bone. For easy tuning, this baby uses Chrome-plated Ping tuners. The Eastman AC322CE Grand Auditorium Acoustic-Electric Guitar is set up with Martin SP phosphor bronze .012-.054 strings. The offer is rounded with hardshell case and Eastman Limited Lifetime Warranty, for peace of mind. Unique as they are, we can’t pick a favorite from these puppies. The E20D is, simply put, synonymous with acoustic guitars, while the E10D is big and bold, as it well should for an ensemble instrument; AR371CE SB, on the other hand, would make a prized piece, while the E10OM can be considered a quintessential fingerstyle instrument; conversely, the E20 may be small-bodied, but has a powerful voice, and the E20OM will fill more than a parlor. Further on up the road, the E10P may look small-bodied, but it delivers strong sound, whereas the AC422CE combines the best of both worlds for fingerpickers and flatpickers; similarly, the AC322CE is a true hybrid, holding the punch and bass of a dreadnought, without any sacrifice. We hope you learned something new today, feel free to treat yourself with one of these amazing guitars as early as today!